In all the articles in this series, we have seen how good and healthy movement in the horse depends on its mobility in the forehand. Of course, mobility alone is not enough, and I will later discuss the pitfalls of concentrating too much on the forehand. However, now is the time to delve into the different methods, principles and theories of mobilizing the forehand. 6. Engaging the hind legs and lifting in front. When the neck and shoulders are stiff, it is very difficult for the horse to stretch all his neck muscles at the same time. Ewe necked or short necked horse are in fact unable to do it, as all muscles work together, inhibiting the nuchal spine to stretch. Ride the horse with contact to the bit and in rythm in any gait. Push your hands forwards keeping the rythm and impulsion from behind. Is it possible to make the horse stretch its nose completely to the ground without losing contact to the bit? Every rider should be able to do this with her horse, whenever she wishes. However, it is only a test, there is no point in riding like this more that when testing it out, and perhaps showing the horse how to stabilize. More on that later. If the horse stops on its way down, looks to the outside, runs, slows down, bucks, shakes its head, or in any way disturbs the even stretching down and forwards, the horse is stiff in its neck, shoulders, withers or back. A horse that is too short in its neck, is not able to bend through its whole body. The topline is too short. If we ask it to move in a correct outline, it will perhaps even struggle to breathe, swallow, and to open behind. Among many other things. We must scale the exercises for the horse. In my work I encounter countless horses with the short neck problem. Cold blooded draught horses, fjords, northlands, many icelandic horses, and heaps and heaps of riding horses and other presumably well trained ones. They have one thing in common. They are not able to stretch like the dark bay horse in the first picture. They may have different problems that are the origin of the symptom, but the medicine is the same: Stretch the shoulders, and unfold the neck. Now, in order to stretch the shoulders, we must in the beginning ask only for a bending of the first degree This is a principle I once got from a very good riding theory book written by the German Waldemar Seunig. He states that a horse that is too stiff must not be forced to bend through its whole body at once, because he will not be able to. One must first ask for bending only in the neck and shoulder. Most riders have learnt that this is completely wrong, and that the shoulder must be held in place by all means. 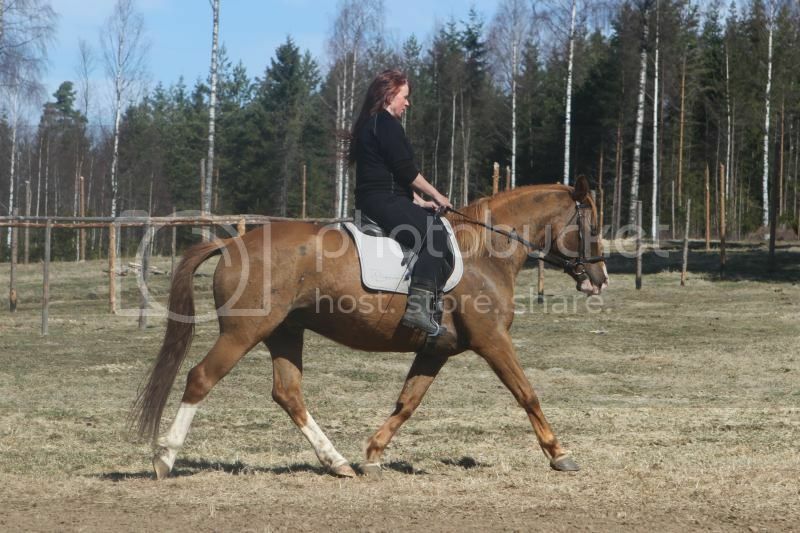 But that is when you start riding in a quite advanced way, asking for impulsion and straightness. And of course you should not do all that on a horse that is not even able to stabilize its back. So, you ride on a circle, and you ask the horse to bend more than the circle suggests. And you know what? That is what is called hyperflexion. You bend more that normal. You ask the horse to stretch only the muscles on the outside of its neck and shoulders. Stretching only one side, especially when allowed to poke its shoulder to the outside is so musch easier for the horse. And if he is allowed to do this for a time on both sides, the stretched and more supple muscles will allow the shoulder back in place, but now with a longer neck and more mobile shoulders. In this work it is of vital importance to hold the inside hand still and to let go of the outside rein. The horse must be allowed to stretch through the outside rein, and to trust the inside rein to be completely still. 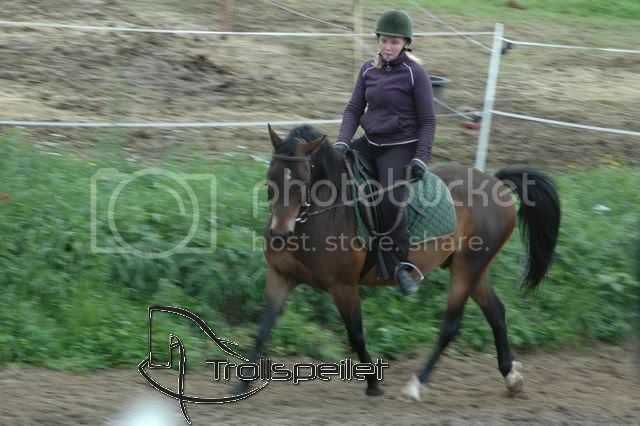 And I know this is completely contradictionary to the way one should ride on a horse that works as it should. If you do this right, the horse will use the inside rein as a constant, stretching against it like a human can stretch against a painball or a foamroller. Or when we take hold of a bar with the hand to stretch our shoulder and lean away from the bar. If we do it right, the horse will want to stretch himself, and we must only wait for the horse to figure it out. Eventually, the horse will find out how to move inside the frame, and how nice it is to stretch with the inside rein as a constant. A moderate stretching to the inside. Some horses may need a higher flexion. It is important that the rider feels what is necessary and what the horse wants to stretch into. Start in walk and proceed to other gaits only after the horse has become more supple. Make sure that you DO NOT hinder the horse's back movement. After stretching like that on both sides, the horse will be more likely to follow the hands of the rider forwards-downwards. The horse will stretch and snort several times, maybe even cough the first couple of times. This means that the midline section is more stable, and that the horse is able to breathe more deeply. When shoulders and neck are more mobile, the rider can go back to riding to the outside rein, because the bridge from the hindquarters to the bit is restored. Sometimes this work can take days, weeks or months, if the problem is very ingrained, but most often it will take a very short time to stretch, perhaps only one lesson. This work is not as easy as it may sound. It requires understanding, feel, and experience. But training like this may also give the beginner at good feeling for how it is possible to push the horse's nose forwards also when riding in a more collected outline. 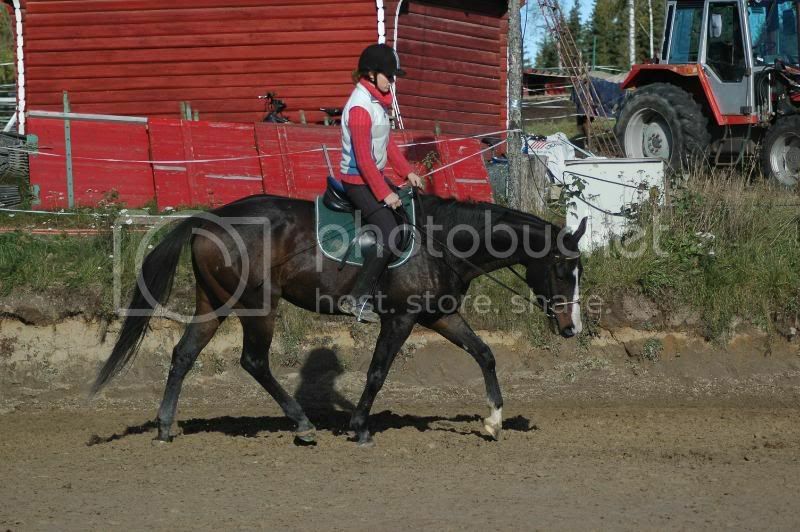 Long and low is the principle of letting the horse stretch like in the first picture. You may ride the horse like this for a longer period of time, but I do not recommend it. It only strains the front legs of the horse, for it is impossible to carry from behind in this outline. However, it is a very nice way to let the horse restore its midline stability. And it is impossible for the horse to stretch like that and at the same time be down in the withers. For if he is, he will stumble, the room for the front legs being too low. The long time training point is not to ride long and low, but a little more over the back. That means we must find out how to use all the things we learn in applying the techniques described, to let the horse carry over the back while in a shorter outline. 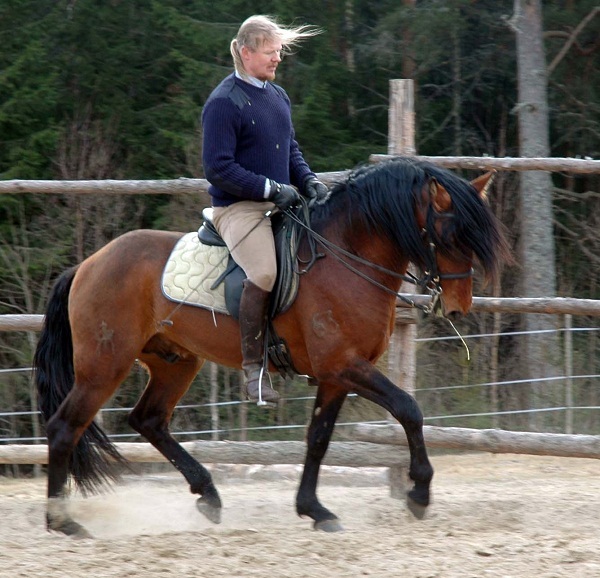 This requires that the rider is able to both let the back of the horse swing through his hips (circle motion) and at the same time engage hind legs and carry. Round and over the back. There are many different exercises to mobilize the horse's hips and hindquarters; lateral work, backing up, transitions, etc. But the description of this work is outside the scope of the series. That does however not mean that they are not important, quite the opposite. They are the only way to help the horse to become strong and supple enough to carry from behind. Besides, I have written a lot on this before, regrettably most in Norwegian. Well, we will see if that can be remedied in the future. Now I have to concentrate on the task at hand. 6. Engaging the hind legs and lifting in the front. Well, outside the scope as well, but important to include, so we don't lose the goal in sight. I have very few videos, but here is a quite dark one, showing Misty (the chestnut with the former thick and short neck) in his first piaffe that really was able to lift the front, at least for a couple of steps. This was made possible only because he was freed from his short neck muscles and able to lift his withers. The strength he had from before. In the next section I will get back to the original reasons for my writing this time: The use of hyperflexion, draw reins, and rollkur. What is wrong and dangerous with these, and which part contains actually something useful.